In November 1997 the Naval Institute Press published Ellsberg's biography, Salvage Man, by John D. Alden. I had been working on cataloging Ellsberg's papers since 1982 and had completed over 12,000 pages and 1,000 photos for Alden's research. Due to the high price of paper at the time, and perhaps the wealth of information, they made Alden cut the book by nearly one-third. Much important material wasn't included, so this website will present as much of the "lost" material as possible. Unfortunately, too, the NIP only printed 1,500 copies and did no publicity, so that within two years the book was out of print. Alden and I hope to republish it in conjunction with the republication of some of Ellsberg's best known works. Few American naval officers have been as unconventional as Edward Ellsberg and still managed to rise to the rank of rear admiral. This probing biography shows Ellsberg time and again confronting the Navy's conservatism, service politics, and professional jealousies to literally salvage the unsalvageable. Author John Alden vividly describes Ellsberg's first public success in 1926 when he raised the sunken submarine S-51. Two years later he made headlines again during an attempt to save six men trapped in the S-4. In 1941 Ellsberg managed to refloat two Italian dry docks that everyone considered unsalvageable. Then, as Gen. Dwight D. Eisenhower's salvage officer for North Africa, he unblocked the sabotaged port of Oran, raised more dry docks, and rescued torpedoed ships. In 1944 he was instrumental in preparing the artificial harbors that made the Normandy landings a success. These World War II accomplishments earned Ellsberg the Order of the British Empire but only reluctant notice from his own navy, although he exerted a lasting influence on U.S. submarine recovery operations. Taking full advantage of Ellsberg's extensive collection of papers and archives on both sides of the Atlantic, this insightful study is the first to focus on the determined admiral. A man of many talents, Ellsberg also published a number of books, including the very popular On the Bottom, which brought the story of salvaging to public attention. John D. Alden enlisted in the Naval Reserve in 1942, attended midshipman's school, and made three war patrols in the southwest Pacific on the USS Lamprey. He later served on the submarine Sea Cat and the aircraft carrier Palau before becoming an engineering duty officer. In that capacity he filled a variety of positions at the Electronic Supply Office, the Office of the Supervisor of Shipbuilding at Groton, San Francisco Naval Shipyard, the Bureau of Ships, and Portsmouth Naval Shipyard. Following his retirement from active duty in 1965, Commander Alden was employed by Engineers Joint Council as director of manpower activities for thirteen years and then from 1978 to 1987 as accreditation director at the Accreditation Board for Engineering and Technology. Alden's long-standing interest in naval affairs and ship histories has been evidenced in many articles published in the U.S. Naval Proceedings, Naval History, and other maritime journals. Four of his earlier books have been published by the Naval Institute Press: Flush Decks and Four Pipes, The American Steel Navy,The Fleet Submarine in the U.S. Navy, and U.S. Submarine Attacks During World War II. In 1994, he was awarded a research grant from the U.S. Office of Naval History to work on this biography of the late Rear Admiral Edward Ellsberg, whose salvage exploits had made him one of the author's boyhood heroes. A resident of Delmar, New York, Commander Alden remains active in civic, church, and Boy Scout affairs and enjoys traveling with his wife throughout the United States and abroad. 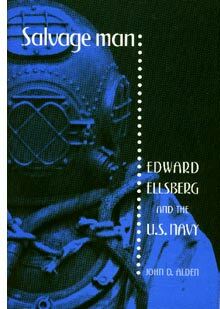 Salvage Man: Edward Ellsberg and the U.S. Navy, John Alden's biography of Navy salvage officer Edward Ellsberg, at times races along like a suspense-filled thriller. Ellsberg's career ascent from Naval Academy midshipman to rear admiral contained almost all the elements of an action-adventure movie: courage and a willingness to take personal risks; impossible accomplishments under unbearable circumstances; wartime danger; technical competence and innovation; and political controversy. John Alden is well qualified to write about Edward Ellsberg. An experienced submarine officer and author of authoritative works on U.S. submarines, he possesses a comprehensive understanding of the Navy and its policies and politics during Ellsberg's era. Alden had access to Ellsberg's voluminous correspondence with his wife and other people. He has used this material well to give the reader an insight into Ellsberg's thoughts and dreams. Salvage Man is handsomely printed and the book has an excellent index. Alden's selection of photographs compliments the book well and helps the reader visualize the dangers and difficulties associated with salvage. Alden has written an authoritative biography which brings much-overdue attention to a man who made superb contributions to Navy salvage in peacetime and to his nation in time of war. When Edward Ellsberg graduated first in the Class of 1914 at Annapolis, his career could have gone in many directions. Following his initial assignment aboard the battleship Texas, the Navy sent Ellsberg to Massachusetts Institute of Technology for postgraduate training in naval architecture. During WWI he was reassigned to the Brooklyn Navy Yard, but at war's end he returned to MIT and received a master's degree in 1920. He also made a significant career change by leaving the line officer corps and becoming a naval constructor. Alden's analysis of the discrimination against constructors by the Navy is perceptive and revealing, and though Ellsberg loved the engineering work in which he was engaged, he felt this discrimination keenly. At the Boston Navy Yard in his first assignment as a constructor, Ellsberg proved to be an active, take-charge officer who did not avoid confrontation or controversy when he felt he was right. Despite the doubts of his seniors, he designed an innovative method for launching large ships which proved effective. Ellsberg's next assignment took him to the New York Navy Yard in 1924 where he showed brilliance and perseverance in solving ventilation problems on the passenger liner Leviathan. His career took another major direction change in September 1925 when the submarine USS S-51 (SS 162) sank after being struck by the steamer City of Rome. The Navy determined to raise the sunken submarine and Ellsberg, who had no experience in such matters, volunteered for the job. Heading the salvage team was Captain E. J. King for whom Ellsberg worked directly as salvage officer. The salvage of S-51 took 10 long months during which Ellsberg and the salvage team battled against inadequate resources, a shortage of experienced deep-sea divers, primitive equipment, and uncooperative weather. During the operation Machinist Mate Lomie Waldern invented what became known as the "Falcon nozzle," which greatly facilitated underwater removal of mud and debris. Ellsberg, who realized the importance of doing what your men had to do, became the first naval officer to qualify as a deep-sea diver. Ellsberg said, "If I was going to control the diving operation on the bottom of the sea, the bottom of the sea was where I belonged." Recognition came in different forms. Ellsberg established a reputation as an expert in submarine salvage, and he received the Distinguished Service Medal for his innovations and hard work. Perhaps more significantly, the character of the man was measured by the comment of deep-sea diver Francis Smith who shook his hand at the end of the operation and said "There isn't one of that bunch of divers, Mr. Ellsberg, who wouldn't go to hell for you!" The loss and salvage of S-51 attracted considerable press attention and gave Ellsberg the opportunity to start speaking and writing about the Navy and salvage work. Naval ethics of the time held that an officer should not use his experience to lecture or write for profit, and Ellsberg came under much criticism for this employment. A change in the law regarding naval promotions resulted in severe inequities which would have required Ellsberg, as a promotion-eligible and highly competent naval constructor, to wait years for promotion until his line officer running mate also became eligible for promotion. A man of Ellsberg's abilities could not wait for the bureaucracy to reward merit, and he resigned in 1926 and started work for the Tide Water Oil Company. In the late 1920s Ellsberg began a long and prolific career as a writer of naval history and fiction, beginning with On the Bottom in 1929; an account of the salvage of S-51, it became a best-seller. A subsequent book, Pigboats, published in 1931, was made into the movie Hell Below by MGM studios. Ellsberg resigned from Tide Water in 1935 and continued to write and lecture. Ellsberg re-entered the Navy on December 8, 1941. His return to the Navy was not without controversy and some people suggested he should not be re-commissioned but, as Admiral Nimitz said of him, "If the Navy ever needed a salvage officer, they need one now!" By March 1942 Ellsberg was in Massawa, Ethiopia, with the responsibility for clearing the port and returning the dry-dock and ship repair facilities to service. If conditions of the S-51 salvage had been difficult, the situation in Massawa was almost beyond belief. The Italians had sabotaged and destroyed facilities and sunk ships as they exited the port. The summer heat and humidity on the Red Sea were extreme, with temperatures rising well above 100 degrees to 145 in dry-docks to as high as 160 on steel deckplates. Equipment was damaged, decrepit, or non-existent. Experienced personnel were in short supply. Ellsberg received no support from the U.S. Navy and worked in a patchwork quilt of command involving the Royal Navy and the U.S. Navy. Ellsberg threw his heart, mind, and body into clearing the port. He drove himself and his men to accomplish seemingly impossible feats, often at great personal risk. He drew heavily on his own experience as a diver to plan and often to accomplish personally very difficult work. The results showed him to be a man of action, intelligence, and personal courage. Alden's description of Ellsberg's activities is among the most gripping of the book, and reading his passages in the comfort of one's home scarcely allows one to appreciate work under the Red Sea sun. Ellsberg succeeded in restoring Massawa's capability as an important regional repair facility but at great personal cost. He was subsequently to receive the Legion of Merit for his successes at Massawa. The Allied invasion of North Africa and capture of port facilities demanded more harbor clearance and ship repair work, and Ellsberg went without a break from Massawa to North Africa, arriving in November 1942. Here he encountered many of the same problems of supply, equipment, personnel, and divided military control that he had experienced in Ethiopia. Additionally, he encountered considerable professional animosity from the Navy's senior salvage officer, Commodore William A. Sullivan. Ellsberg worked frenetically clearing harbors and salvaging torpedoed ships. His successes were great (he later received a second Legion of Merit) but the physical strain was too much for a man in his fifties. Ellsberg was hospitalized in February 1943 and he returned to the United States for recuperation and shipbuilding responsibilities in New York. Ellsberg was back in Europe in 1944 with a posting to London for duties involving the invasion of Normandy, and he made it to the beaches 6 days after the landings of June 6, but he was soon back in London and then back in the U.S. by September 1944. His final, brief naval assignment took him to Cleveland as supervisor of shipbuilding for small craft, but he was not well - his work in the Red Sea had drained him - and in March 1945 he was released from active duty. Following the war Ellsberg continued to write articles and books, including Under the Red Sea Sun, an account of the salvage at Massawa. He also consulted for shipbuilding companies. An active, vigorous man, he enjoyed traveling and sailing in his sloop. He passed away in 1983 with the rank of rear admiral. Alden's biography of Edward Ellsberg will surely motivate any reader to seek Ellsberg's books for a first-person account of some of the most difficult Navy salvage projects ever completed. The name of Edward Ellsberg is well known in marine salvage circles. He made his name as the American naval officer who successfully salvaged sunken submarines and wartime wrecks when others said it could not be done. Ellsberg, who died in 1983, had written so extensively about his work at the time, that author John Alden's initial reaction when asked to write his biography was that there was little left to be said about him. But a family archive revealed a wealth of further information, not only on his exploits, but on the man himself, not least many hundreds of letters written to his wife Lucy of sixty years. As a result, Alden has been able to marshal a wealth of source material to go beyond Ellsberg's somewhat self-publicising writings to present a well-rounded portrait of the man and his work. Himself a former naval engineer officer, Alden is not only sympathetic to Ellsberg and the difficulties he encountered but can explain clearly the technical features of his work, and why he was successful where others were not (He had the irritating habit to the authorities of being proved right most of the time, based on sound technical knowledge and backed up by a robust personality. But he often chafed under a lack of recognition and long delayed promotions). Ellsberg was one of very few Jews to be accepted into the US Naval Academy in 1910. Coming near the top in almost all of his studies (which had a strong engineering emphasis) he was encouraged to remain a line (executive) officer, but preferred to transfer into Naval Construction. Work in Brooklyn and Boston Navy Yards gave him opportunities to shine both in supervising new construction (USS Texas; Ed: USS Tennessee) and in repairing older ships (liner Leviathan's serious problems with her boilers and ventilation). He made his name raising the submarine S-51 which had sunk in 1925 after a collision - the experience formed the foundation of extensive lecturing and writing in popular journals. Frustrated in the peacetime Navy, he went into the oil industry, but remained in the US Naval Reserve. It was in that capacity that his most valuable work was done from 1941 onwards. Under appalling conditions, the captured Italian naval base of Massawa was brought back into operation at a critical time when Rommel was approaching Alexandria, by raising block-ships and salvaging three floating docks. Later he carried out similar work in French North African ports, though he was hampered by uncooperative and technically illiterate authorities, civilian and military, and starved of men and equipment (the Pacific war took priority). Photographs give an impression of the scale of work on damaged ships and an idea of Ellsberg's "can-do" approach. Sent to England to advise on preparations for the D-Day landings, he found himself in a difficult situation with little authority, as the British had prime responsibility for the naval side of operations. Responsibility for the provisions of the two Mulberry harbours was shared between the Admiralty and the War Office, which had not recognised the scale of the problem or the resources required for deploying the Phoenix concrete breakwater caissons. Once completed, these were grounded off Selsey Bill, to be refloated after the beachhead was secured and towed to Normandy. Ellsberg was the catalyst that finally got the authorities to recognise the scale of the salvage operation required to pump out and refloat over a hundred caissons in a matter of a few days - without which the whole artificial port concept would have been jeopardised. Alden's book is well researched and referenced, providing an easily read and understood account of a talented engineer well aware of his capabilities. Both Ellsberg's successes and his setbacks are fully described. If you have already read any of Ellsberg's books (such as Under the Red Sea Sun or The Far Shore) you will want to see the broader picture that Alden presents. Even if you have not, you will still find yourself turning rapidly to each successive chapter to find out what happens next in a well-paced story. To this day, I keep and treasure battered copies of Commander Edward Ellsberg's books On the Bottom,Men Under the Sea, and Under the Red Sea Sun - books I read and read again as a teenager. I devoured these stirring accounts of deep-sea salvage, reading by flashlight under the blanket after lights-out, an environment not unlike the tunneling under the sunken S-51 so vividly described by Ellsberg. I often wondered who this "Commander Ellsberg of the Navy" was. Now, thanks to John Alden's sterling biography, I know. Born in Colorado in 1891, Ellsberg graduated from Annapolis in 1914, at the head of his class academically but low in military efficiency. In his career he was a "can do" engineer, salvage master, inventor, writer, lecturer, and public figure both in the Navy and in civilian life. Author of thirteen (Ed: 17) popular books on marine salvage and countless articles for the technical and popular press, Ellsberg became well known for his technical commentary on maritime and naval engineering matters. He left the Navy twice, frustrated by its bureaucratic ways and its displeasure with his public stature. Twice he returned when the Navy needed him. The salvage and raising of the submarine S-51 first brought national recognition. The S-51 had been rammed off Block Island, Rhode Island, in September 1925, losing all but three hands. At the time, the Navy had no deep-water salvage capability and was dependent on maritime contractors. Ellsberg convinced the commandant of the Brooklyn Navy Yard that he could raise the S-51 with Navy divers and ships. The Navy would salvage its own. Lying far over on its side in 132 feet of storm-tossed winter water, the S-51 presented formidable salvage problems, Ellsberg, who had qualified as a diver, rounded up about all the divers the Navy had and set to work. First, they had to clear the tangled topside rigging from the submarine. To do this Ellsberg developed an underwater cutting torch, which he later patented and that became the standard for underwater work. Next, the divers bored tunnels under the boat, using high-pressure hoses to flush out the silt. Through these tunnels chains were passed and attached to flooded pontoons, which, when blown full of air, would lift the S-51. All this sounds deceptively easy, but it was cruel, hard work. The weather was miserable, tunnels collapsed on the divers, the pontoons would lift unevenly, and the submarine would slip back to the bottom. Finally, in the summer of 1926, the S-51 was brought to the surface and towed back to the Brooklyn Navy Yard, where the bodies of its crew were recovered for burial. In 1929 Ellsberg wrote his first book, On the Bottom, about the salvage of the S-51. It made him a public figure. Ellsberg was not, however, a popular figure in the interwar U.S. Navy: he received too much public attention and was too outspoken. In 1926, denied a meritorious promotion and told that he would have to wait another eight years, he resigned and began a new career as a petroleum engineer and consultant. He returned to active duty briefly in December 1927, to assist with the salvage of the submarine S-4, which had been rammed and sunk off Cape Cod. On 8 December 1941 Ellsberg again rejoined the Navy and was sent to the Red Sea to clear the wrecked ships left by Axis forces to block the port of Massawa, Ethiopia (now Eritrea). Clearing and opening the port involved hammering together a workforce of British, American and Italian technicians, rebuilding the port's machine shops, and refloating a sunken drydock and several ships. Ellsberg raised the drydock in nine days and was promoted to captain - all this in fetid heat and in the face of obstinate British and American naval bureaucracies. In November 1942 he was rewarded for his accomplishments at Massawa with a transfer to the North African coast, where he cleared the ports of Oran and Algiers for Operation Torch. Here he conquered once again the problems of Massawa, with the Vichy French added for flavor. From North Africa he was brought to England to advise on the Phoenix Project, huge concrete caissons that were to be sunk off Normandy to form breakwaters for artificial harbors to be constructed immediately after D-Day. It appears that Ellsberg was less happy than in the Red Sea and North Africa, for he was not a man well suited to advising with tact and diplomacy other engineers who were about to get into serious trouble. After the war, Ellsberg returned to private life as a consulting engineer, eventually retiring to Maine, where he continued to lecture, write, and stay in the public eye. He died in 1983 at ninety-one. Ellsberg's biographer, John Alden, is a former submariner, naval engineer, and author of several previous books for the Naval Institute Press. In 1984 (Ed: 1994) he received a grant from the Office of Naval History to write Salvage Man. Alden paints a portrait of an extraordinarily competent, capable, "hands on" officer who was tenacious, focused, and knew exactly what needed to be done and how to do it. Ellsberg was blunt and direct. He built organizations where none existed, often with little support or even against serious resistance from higher authorities. He was a "shade tree" mechanic and a robust field engineer who taught men how to do their jobs under difficult circumstances, leading by doing himself. At the age of fifty-one, he was diving on wrecked ships, placing pumps and explosives. In his own words, "It never pays to quit until you're dead." "Ship torpedoed. Get to sea!" So reads a typical message to then Commander Ellsberg in a working day (or night) in his assignments as salvage leader in the European Theater of Operations in World War II. This experience carried him from raising sunken wrecks in the harbors of Abyssinia, liberated by the British from Italy, to similar work in harbors taken by the British 8th Army in North Africa, and finally to the beaches of Normandy, where he cleared up an unholy mess in the placement of the Phoenix caissons for Operation Mulberry - the artificial harbors that enabled the Anglo-American-Canadian armies to crack the wall of Hitler's Fortress Europe in the spring of 1944. I came to know Ellsberg's legendary feats from my father Alfred Stanford, who served as Deputy Commander of the US Mulberry. Admiral Cunningham, British commander in the Mediterranean, saw how Ellsberg's methods worked, and also how he threw himself into the work in person, and gave Ellsberg high marks, supporting him through all difficulties, including those with US Navy commanders who resented Ellsberg's abrasive ways. Fortunately, Cunningham was in England for the Normandy invasion in 1944, and his urgent operational memo written just two-and-a-half weeks before the invasion broke through the bureaucratic fog and brought the matter of unusable Phoenix units to Winston Churchill's attention, which finally led to action. This was Ellsberg's shining moment, testing pumps that didn't function, taking no one's word for anything, training emergency crews, and commandeering needed equipment. Commander Alden's technical service in the US Navy enables him to picture clearly and accurately the complex problems Ellsberg dealt with in his Paul Bunyanesque way. This fine biography traces Ellsberg's career from a tough childhood through graduating at the top of his class from the US Naval Academy, and the salvage of the sunken American submarine S-51 in the 1920s, into a leading role in US Navy salvage in WWII. Alden brings this indomitable person to life in these pages, without gilding any lilies. He carefully compares different versions of critical events and catches the flavor of Ellsberg's talk as well as the rhythm of his walk, and what my father used to call the saintly simplicity of his character. When a ship needed raising, one tempestuous naval officer was the man for the job. Edward Ellsberg first attracted attention when he salvaged the submarine S-51, rammed off Block Island in 1925. During World War II he achieved distinction for raising scuttled floating dry docks in the Red Sea. In and out of the Navy, Ellsberg was a man of many talents. One of the most prolific authors ever to graduate from the U.S. Naval Academy, his 17 books included several award winners, and his stories appeared in popular magazines throughout the 1930s and 1940s, enthralling many a young reader. The son of Jewish refugees from czarist Russia, Ellsberg barely met the height and weight requirements for admission to the Naval Academy. He changed his name, Ned, to Edward as more befitting a naval officer. Despite his diminutiveness, he won two medals in fencing, wrote two prize essays, and won top honors in seamanship and navigation. Although he was the top student in ordinance, two gunnery awards went to rival classmates, the predominant theory being that those prizes were diverted deliberately, lest Ellsberg run off with every honor for the Class of 1914. He took great pride in being the first Jewish midshipman to graduate at the top of his Naval Academy class. After a year on board the battleship Texas (BB-35), Ellsberg studied naval architecture and marine engineering at the Massachusetts Institute of Technology (MIT). As the United States entered World War I, he took charge of converting several seized German liners into transports at the New York Navy Yard and was commended for expediting repairs to the cruiser Huntington (CA-5). He rose rapidly in the Construction Corps to the temporary rank of lieutenant commander and became construction Superintendent for the battleship Tennessee (BB-43). Upon graduation from MIT in 1920, Ellsberg was ordered to the Boston Navy Yard as a planning officer in the Hull and Engineering Departments. His work ranged from submarines and destroyers to battleships and ocean liners, he devised a new method to launch the destroyer tender Whitney (AD-4), and he developed an improved system for the shipboard distillation of fresh water. Cutbacks in the Navy forced him to revert to the permanent rank of lieutenant, but in 1924 he was again promoted to lieutenant commander and transferred to the New York Navy Yard. There he took part in the scrapping of two unfinished battleships that had been canceled after the war. When the former German liner Leviathan, then-flagship of the U.S. Merchant Marine, was having ventilation problems after her conversion to oil, operators turned to the Navy, which detailed Ellsberg to investigate. He and an assistant, John Niedermair, (who became the Navy's chief ship designer in World War II), not only solved the problems but also identified a major deficiency in the forced-draft system for the boilers and serious cracks in the ship's main deck. Ellsberg arranged for repairs and supervised ventilation alterations so that the ship never missed a scheduled trip. He was hardly back at his regular job when the submarine S-51 was rammed and sunk in September 1925. From the rescue vessel Falcon (ASR-2) he watched futile attempts to lift the wreck. He worked out a salvaging plan and convinced his commandant, Rear Admiral Charles P. Plunkett, to insist that the job be assigned to the New York Navy Yard. Plunkett thereupon appointed Ellsberg to be the salvage officer and Captain Ernest J. King, commander of the submarine base at New London, to take charge of the operation. This was the start of a life-long friendship between the austere King and the impetuous Ellsberg. The Navy had no existing salvage organization nor had anyone ever raised so large a submarine, which was lying at a depth of 132 feet. With ships, equipment, and divers from throughout the fleet, the salvagers struggled to raise the hulk until winter weather set in. Ellsberg then started a school to train more divers, including himself, thereby becoming the first Construction Corps officer to qualify as a deep-sea diver. By the time the S-51 was raised, he had overcome a series of unprecedented technical problems, redesigned the lifting pontoons, and invented an improved underwater cutting torch. He warned the Navy that its submarines were unsafe and its salvage organization inadequate, and he wrote a detailed report that served as a bible for future submarine salvage operations. As a result of their work on the S-51, King, Ellsberg, and Lieutenant Henry Hartley of the Falcon received the Distinguished Service Medal, the first time it was awarded for a peacetime exploit. The Navy Department, however, rejected King's recommendation that the other two be promoted. Ellsberg's immediate superior, Captain Henry T. Wright, complained to Congressman Emanuel Celler, who introduced legislation to promote the officers over the objections of the naval establishment. In the meantime, Ellsberg had decided to resign from the Navy to work as chief engineer of the Tide Water Oil Company. Unfortunately, this controversy and charges that his speaking activities were some how improper (later dismissed by the Secretary of the Navy) soured his departure. Ellsberg had hardly settled in his civilian job when in December 1927 the submarine S-4 was rammed off Cape Cod. Immediately, he was sworn back into the Naval Reserve and rushed to the scene. The nation was horrified as six trapped men tapped their final messages on the steel hull, while Navy rescue ships tossed helplessly, prevented by storms from sending divers down. At the risk of his own life, Ellsberg inspected the hulk once the weather abated. He continued to warn that official complacency and political penny-pinching were making further submarine disasters inevitable. The Saturday Evening Post serialized his book, On the Bottom, a dramatic account of the raising of the S-51, and legislation to promote him was revived and linked with a congressional submarine safety investigation. Over repeated Navy objections, Congress finally promoted him to commander in the Naval Reserve, and Congress and the Navy adopted a submarine safety program. As chief engineer of the Tide Water Oil Company until 1935, Ellsberg patented several inventions, including a method for increasing the yield of high-octane gasoline and a process for removing water from lubricating oil. And his writings on the side sold well: Pigboats was made into the 1933 motion picture "Hell Below." By 1935 Ellsberg recognized that the rise of fascism and Nazism in Europe, as democracies continued to disarm, was leading inevitably to war. He resigned from his job and struck out on his own as an engineering consultant, adding preparedness themes to his repertoire of submarine salvage speeches. Ellsberg was also preparing himself for active service by requesting Naval Reserve training without pay. On 23 May 1939 he was on board the aircraft carrier Ranger (CV-4) when the submarine Squalus (SS-192) foundered off Portsmouth, New Hampshire. Once again, Ellsberg rushed to the scene, only to be dismissed brusquely by the Navy. When war broke out in Europe, his outspoken criticism of British mistakes and U.S. unpreparedness renewed publicity. After an address at Chicago in February 1940, some naval officers complained that he violated a directive "discouraging" service personnel from speaking or writing about the military situation. The Chief of the Bureau of Navigation, Admiral Chester Nimitz, demanded that he explain his actions and future intentions. In response, Ellsberg promptly submitted his resignation and continued to speak out in support of aid to the Allies. Barely a year later, Nimitz wrote again, urging him to apply for a new commission. Ellsberg then approached the head of the Bureau of Construction and Repair, and was given the insulting advice that he was better suited for a position in public information or in the defense industry. Undeterred, he hastened to Washington the day after the Japanese attack on Pearl Harbor and was sworn in as a lieutenant commander for the fourth time in his career, accepting a position under the Army Corps of Engineers to assist a Lend-Lease contractor in restoring the demolished Italian naval base at Massawa, Eritrea, and clearing the harbor of scuttled ships. Ernest J. King - at this time an admiral and the Chief of Naval Operations - wished him well but told him he could expect no help from the U.S. Navy; the Red Sea was an area of British responsibility, and the Navy had its hands full in the Pacific. Plunging into his new job with characteristic energy, Ellsberg embarked on a hair-raising voyage to Lagos, Nigeria, in a hastily chartered merchant ship with inexperienced or incompetent officers and a surly and rebellious crew. From there he flew to Massawa, where he took charge of a floating dry dock the British had towed from Persia and started servicing supply ships from the Mediterranean. He then declared Naval Base Massawa in operation, even though it was under the Army, serving mostly British ships, and the only naval officer was Ellsberg. In nine days, he and his crew raised a big Italian floating dry dock that had been written off as unsalvageable. The head of the Army mission, Major General Russell Maxwell, was so impressed that he got the Navy to promote Ellsberg to captain. When his little salvage ships finally straggled in from the United States, Ellsberg put them to work raising sunken ships. Through heat and humidity that the British claimed Europeans could not stand, in eight months he re-floated four cargo ships, another dry dock, and a floating crane; refurbished more than 80 supply ships; and repaired three British cruisers in an undersized dry dock by lifting one end at a time. The British were lavish in their praise but laggard in providing the needed manpower. The press hailed his achievements as "the miracle of Massawa." But the U.S. Navy simply ignored his existence. After the destruction of port facilities at Oran, Casablanca, and other seaports in the November 1942 Allied invasion of French North Africa, General Dwight D. Eisenhower called Ellsberg from Eritrea to become chief salvage officer for the western Mediterranean. Rushing from port to port, he raised two more scuttled floating dry docks, salvaged several torpedoed British warships and troop transports, and opened the blocked harbor at Oran to Allied supply ships. The Navy's reaction was to deny him salvage equipment that had been sent to Casablanca, on the grounds that it was needed more urgently for the capsized ex-French liner I in New York Harbor. Sent home after being diagnosed with incipient heart failure in February 1943, he went to the office of the Supervisor of Shipbuilding in New York, where he inspected and expedited work on warships. While there he was awarded the Legion of Merit for his achievements at Massawa. His work in North Africa escaped the Navy's attention, however, until Admiral King nominated him for a second Legion of Merit. The British Admiralty named him a commander in the Order of the British Empire. Ellsberg soon saw the stateside job too tame and in April 1944 asked Admiral King for something closer to the front. In a few days he was in London, helping to prepare top-secret artificial harbors for the Normandy invasion. With D-Day only a few weeks off, Ellsberg's intervention was instrumental in breaking a deadlock between the Admiralty and the Royal Engineers, which threatened to jeopardize the invasion. By mobilizing the entire salvage resources of the United Kingdom, the Royal Navy barely managed to get the artificial harbor units ready on time. Had they not been available, General Eisenhower might have had to postpone the invasion. Ellsberg rode one of the caissons to Normandy and helped unsnarl wrecked landing craft and vehicles on the beach. When a storm two weeks later temporarily crippled the flow of supplies, he was called back to assess the damage at Omaha Beach. Although he and the officer in charge were confident they could restore operations in a few weeks, the installation was cannibalized to repair its British counterpart at Arromanches. Ordered home in September 1944, he reported to Cleveland, Ohio, as Supervisor of Shipbuilding for the Lake Erie area. Fatigue was catching up with him, however, and ship construction was winding down, so Ellsberg asked to be relieved from active duty. On 3 April 1945 he returned to civilian life. Not one to idle long, Ellsberg resumed his consulting and writing. His book about Massawa, Under the Red Sea Sun, was an immediate success, as were his later Cruise of the Jeannette and No Banners, No Bugles - the story of his experiences in North Africa. Consulting work continued to occupy him until 1958, and his final book, The Far Shore, was published in 1960. He divided his final years between Maine and St. Petersburg (Ed: St. Petersburg Beach) Florida, and received honorary degrees from Bowdoin College and the University of Maine; the University of Colorado had awarded him a doctorate in engineering in 1929. During the 1960s Ellsberg was invited to present awards to graduating recruits at the Great Lakes Naval Training Station, to address officers at the Navy's salvage school, and to speak at the launching of the guided-missile frigate Talbot (FFG-4). Even his old service seemed finally to appreciate the salvage man. He died on 24 January 1983, and the Navy gave him its final tribute with a memorial service at the Naval Air Station in Willow Grove, Pennsylvania, after which his body was laid to rest alongside those of his wife and daughter (Ed: daughter's ashes were scattered in the ocean at Southwest Harbor, ME) in the cemetery at Old Willimantic, Connecticut.